Where is the Rye Police Department? We are located in the Rye Public Safety Building at 555 Washington Rd., next to the Rye Library. Go to the directions page for more info. Why did the Sheriff's Department answer when I called the Rye Police? The Rockingham County Sheriff's Department is the primary dispatch center for the Rye Police Department. They handle all emergency calls 24 hours a day, 7 days a week. They also handle non-emergency calls after business hours. Does the Rye Police Department offer fingerprinting services for employment purposes? Fingerprints are only taken for residents or employees in the Town of Rye. You can come in daily at 5pm (provided officers aren't busy with an emergency). Please bring your fingerprint card (supplied by your employer) and your driver's license. What should I do if I lose electricity? To report a power outage, call Eversource at (800) 662-7764, or go to the Eversource Storm Update page. 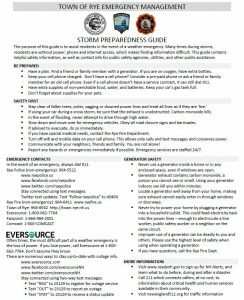 On the website are tips for storm preparation, power outage information, and important safety tips. If you find downed power lines, stay away and dial 911. Watch WMUR TV channel 9, or go to their website for a list of school closings. I'm going on vacation, should I notify the Police Department? Whether you are going on vacation for a couple weeks, or you are leaving your summer home for the off-season, we encourage you to complete the vacant residence form. This will give the Rye Police valuable information in the event of an emergency at your home while you are away. For more information on keeping your home safe while you are away, go to the Crime Prevention page. There is a seal on the beach, what should I do? Under the Marine Mammal Protection Act, people need to stay 100 yards or more away from the seal. It is common to find seals on land, since they normally spend much of their time out of the water resting, sunning or sleeping. If you notice any entanglement or obvious injuries, call the Seacoast Science Center Marine Mammal Rescue Team at (603) 997-9448. If you notice anyone disturbing a seal, contact the Rye Police Department at (603) 964-5522. Am I allowed to have a camp fire on the beach? Small camp fires are only allowed with a burn permit issued by the Rye Fire Department. All fires, whether on public or private property, require a burn permit. Beach fires can only be on rocky portions of the beach (NOT on the sand). The permit holder must be with the fire at all times. Fires must be extinguished by midnight. For more information, contact the Rye Fire Department. No. Alcohol is not allowed on any beach, at any time. If persons are found with alcohol, they are subject to a summons and/or arrest. My car was towed. How do I pick it up? If a vehicle is towed by the Rye Police Department, a vehicle release form must be obtained prior to any vehicle being released. The owner must come to the Rye Police Department to complete the release form.